Today we’ve got several inches of snow sitting on the ground, and I’m not a cold-weather kind of person, so I wanted something warm and rich to scent my favorite big, comfy sweater. Hermés Hermessence Ambre Narguile is perfect. I’m probably never going to come out of my pocket for a $255 bottle, even though it is the big 100ml/3.4 ounce size, with as few bitterly cold days as we get in this part of the country, but I’m so glad I had the sample today. 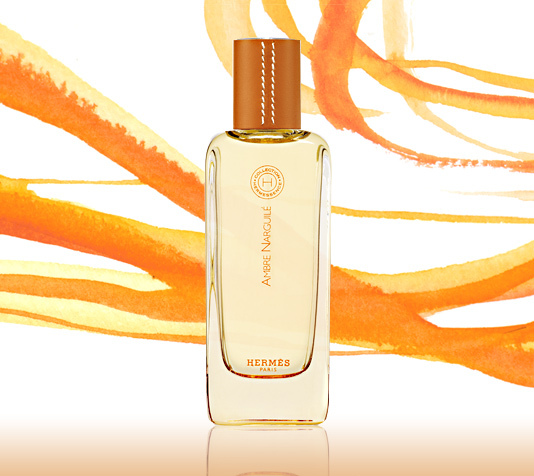 Released in 2004, Ambre Narguile, like the rest of the Hermessence line, was created to evoke a certain place in the world. The term Narguile refers to a water pipe used in some areas in the Middle East, in which tobacco is smoked with flavors of spices, honey, and fruits. From that description, I’d have expected the tobacco note in it to be more prominent than it is, but I’m relieved to find otherwise. This is a scent that does beautifully in winter and really needs the cold and damp. I tried it previously, in the fall, and thought it was too much cloying caramel. Today, I get that caramel note, but not as prominently, underneath the honey and cinnamon. There’s some rum there, and that benzoin-vanilla-tonka bean combo that I love, with faint traces of tobacco, coumarin, musk, and a floral note that is apparently orchid. To be honest, the cinnamon-caramel-vanilla combination reminds me a little bit of apple pie, in the best way. As with all the Hermessence scents, longevity is an issue, but wearing it in the kind of weather where it smells appropriate takes care of that pretty well; all perfumes tend to stay on better in the cold. The projection is reasonable but not loud, and it’s a great snow day scent. I’d rate it a lot higher if I could afford a full bottle, but the company has a great sample policy and will let you try it before you buy.